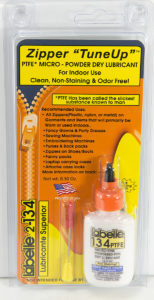 Zipper lubricant for Expensive garments primarily for indoor use. Clean or wash garment first and remove any debris between Zipper teeth. Dust Zipper 'Tune-Up' on with micro-tip applicator, Work the Zipper a few times back and forth. Remove any excess Powder by gently brushing the fabric with you hand. Repeat above after any cleaning of the garment as cleaning will remove any Zipper Tune-Up remaining on the garment.